Hurray! You have finally made it to South Korea, and are totally excited to get your trip – or new life – going. On top of all the dozens and dozens of sights to see that you have on your list, the list of foods to try is an even longer one. Your stomach will growl with hunger and desire every time you think about all the delicious Korean food that will soon feed it. But, wait! Now you find yourself getting a little nervous. It’s your first time in the country, you hardly speak the language, and it has just crossed your mind you’re not sure of the local restaurant etiquette, either. How exactly does one order food in a Korean restaurant? And more importantly: how exactly does one do the food ordering in Korean?! Keep reading and, right here, right now, you will learn exactly how! Invaluable phrases for ordering in a Korean at a restaurant. 메뉴 좀 주세요 (menyu jom juseyo) = Please give me the menu. 메뉴판 좀 주세요 (menyuphan jom juseyo) = Please give me the menu. Usually the menu is visible on the wall of the restaurant, or it’s waiting for you at the table already. On other occasions, the staff will bring you the menu as they begin set the table. However, if for some reason the menu isn’t there, or you want to order more, you’ll have to ask for the menu. The first asks for the menu and the second asks for the menu board, which you’ll encounter much more often. The only difference is that 메뉴판 refers to the physical menu. 저기요 (jeogiyo) / 여기요 (yeogiyo) = Hey, over there!/Hey, over here! When you are ready to order and there is no service button at the table, you may shout for the attention of the waiter with either of these words. Don’t worry, it’s very common and not impolite. Korean restaurants can be quite loud so you’ll need to say it loudly. 주문하시겠어요 (jumunhashigesseoyo) = I will order now. You can add this after the above phrase to express what you want to do. 주문하시겠어요? (jumunhashigesseoyo?) = May I take your order? Not a phrase you would say, but an important phrase to know when it’s said to you. 이거 주세요 (igeo juseyo) = This, please. You can just point at the name or the picture of the menu item you wish to order and say this phrase. The 이거 part can also easily be replaced with the name of the dish. 삼겹살 일인분 주세요 (samgyeopsal irinbun juseyo) = Please give me one serving of samgyeopsal. 닭갈비 이인분 주세요 (dakgalbi iinbun juseyo) = Please give me two servings of dakgalbi. When ordering certain foods, you may wish to order them by servings rather than as separate dishes. 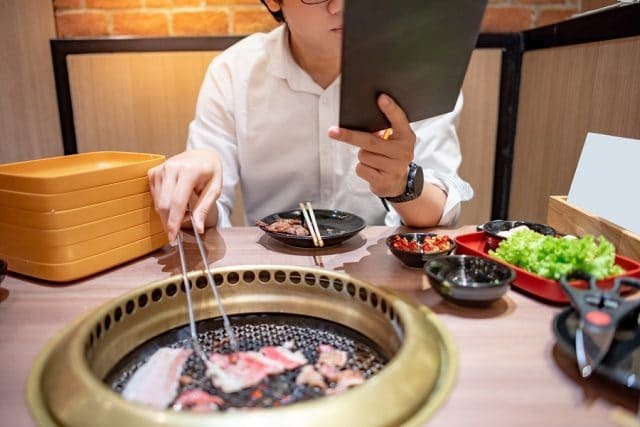 These foods are typically ones that are shared amongst two or more people in one big dish at the center of the table, such as Korean BBQ or dakgalbi. 인분 (inbun) is the word for serving, and in front of the word just add the number of servings you are ordering. 이게 뭐예요? (ige mwoyeyo?) = What is this? 여기 뭐가 들어가 있어요? (yeogi mwoga deureoga isseoyo?) = What is in this? If there is an item on the menu that looks interesting to you but you aren’t sure of what it is, you can ask these questions. The latter is especially good for bars and cafes as well since the names of the drinks don’t always tell you about the contents. 오늘 추천 메뉴는 뭐예요? (oneul chucheon menyuneun mwoyeyo?) = What is today’s recommended menu? 어떤것을 추천하세요? (eoddeongeoseul chucheonhaseyo?) = What would you recommend? 여기 뭐가 맛있어요? (yeogi mwoga masisseoyo?) = What is delicious here? A lot of Korean restaurants specialize in just one type of dish, but there are also many restaurants all around South Korea serving local and foreign dishes. With so many items on the menu, you’ll find your head spinning. At times like these, don’t hesitate to ask the waiters for what they think the best item on the menu is! They work at the place, after all, so they probably know what’s good there. Or at least what the most popular thing is. 이거 좀 더 주세요! (igeo jom deo juseyo!) = Please give me some more of this! Most restaurants offer a range of side dishes to indulge in with your main meal, and it is entirely possible and free for you to request a refill of the side plates. 물 좀 주세요 (mul jom juseyo) = Please bring me some water. Invaluable phrases to indicate dietary requirements. 채식메뉴 있으세요? (chaeshikmenyu isseuseyo?) = Do you have a vegetarian menu? A majority of Koreans are meat eaters and vegetarians aren’t often readily catered to. So it’s important to check with the restaurant staff before sitting down whether there are items on the menu that you can eat. 돼지고기 없는 메뉴 있으세요? (dwaejigogi eobneun menyu isseuseyo?) = Do you have any dishes without pork? Pork also happens to be the staple meat for the daily diet of Koreans, so you will definitely want to check with the waiters about pork-free dishes to eat. Don’t worry, there’s usually other things, at least beef and chicken anyway. Typically, in Korea you do not ask for the bill separately. Instead, you go directly to the counter and pay after finishing your meal on your way out. Additionally, it is customary in Korea, especially at pubs, for one person to pay the entire bill. So if you’re not the one paying for the food, you may wish to return the favor by paying for the dessert at a nearby cafe. Don’t worry though, “going Dutch” is very common these days so the staff can split the bill for you without issue. Many places can even split bills on multiple credit cards. 제가 낼게요. (jega naelgeyo.) = I’ll pay. 내가 낼게. (naega naelge.) = I’ll pay. This is what you’ll say if you want to treat the other person or people in your group for the meal, or even the round of beers. 반반해 주세요. (banbanhae juseyo.) = Please halve the bill. 계산서를 따로따로 할게요. (gyesanseoreul ddaroddaro halgeyo.) = We’ll pay separately. 계산서 나누어 줄 수 있으세요? (gyesanseo nanueo jul su isseuseyo?) = Can you split the bill? And now you are completely ready for your first adventure of ordering in Korean in a local restaurant! Now go out and enjoy all the amazing food Korea has to offer! Need ideas for places you could try out? Check out our list of essential restaurants to try in Korea. 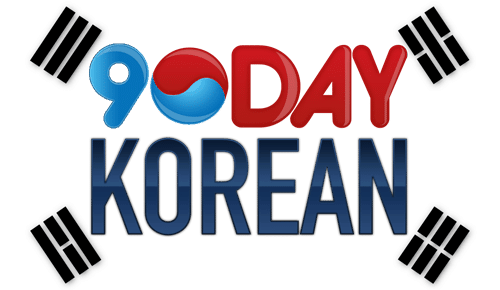 The post Ordering Food In A Korean Restaurant appeared first on 90 Day Korean®.